The bronze has excellent withstand competence against high temperature and to reap the same, we are here with the largest array of the bronze Y strainer that is best suited for the steam, cold water, oil and gas filtration application. This bronze Y strainer is encompassed with the 304 stainless steel screen to strain all the impurities from the downstream and protect the expensive process equipment. The excellent corrosion resistance and high melting point are two major attractions of our bronze Y strainer that has made it the choice of enormous industries to accomplish the flawless filtration operation. This bronze Y strainer meets all the ASME standard requirements and also API standards, which is tested and assured by the quality team and therefore is promising to outperform across lifespan. There is no risk of the rust and plug up while using our bronze Y strainer and hence is become the indispensable part of industries to eliminate impurities and prevent contamination caused by rust. 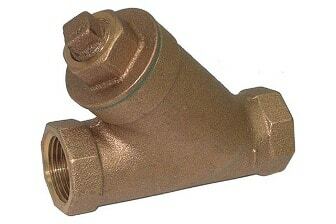 Our collection of the bronze Y strainer is compatible to withstand up to 125 psi operating pressure and temperature up to 200° C. No matter, what dimension you require, we as a bronze Y strainer manufacturer are qualified to provide in any stock at the best rates in India and other countries.